Join 10,106 families served since 2010! Did you tuck a turkey carcass into the freezer after Thanksgiving? Time to get it out! Homemade broth and stock is essential for optimum health. And, thankfully, it's easy and economical to make! They require only a large stock pot on the stove top, or a crockpot, require little culinary skill, and even less attention. You can make stock with a variety of herbs, veggies, chicken, beef, fish, or any other meat you'd like. All are packed with health benefits (and flavor!) that you won't find in commercially produced broth. Throughout history, many traditional cultures have made broths with bones. Stocks are extremely healing and beneficial to everyone. As the bones boil, the minerals from the bones get pulled out into the water, creating a mineral-rich stock. Homemade bone broths are rich in calcium, magnesium, phosphorus and other trace minerals which are essential for optimum health. Because the minerals in broth are easily assimilated, consuming bone broths is a very easy way to get these minerals in your diet. Bone broths also contain glucosamine, chondroitin and gelatin — components that get extracted from the bones. These nutrients are very good for anyone with joint pain or arthritis. Meat and fish stocks made with bones are also very healing to the digestive system. They provide building blocks for the rapidly growing cells of the gut lining. Bone broths have a soothing effect on any areas of inflammation in the gut. This has been used for centuries as a digestive aid and a remedy for the digestive tract. 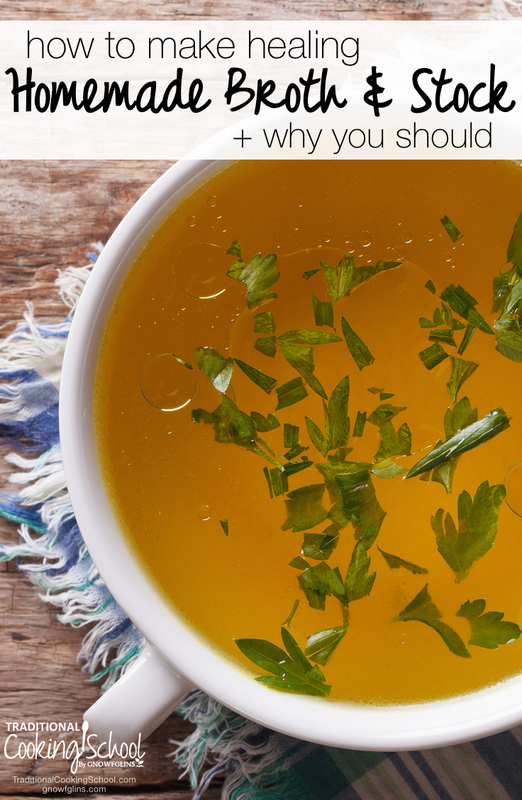 Homemade broths provide many health benefits that commercially made stocks do not. And in addition homemade broths cost much less! A quart size container of organic chicken broth averages around $3.00. If you filled a 5-quart crock pot with commercial stock, you're looking at $15.00! Compare that to the homemade stock I made last night from half an organic chicken that cost me $5.99. That's half the price of commercial — and don't forget how much more healthful homemade stock is! Making homemade broth is so easy. You can make this wonderfully healing food with few ingredients and little time and effort. My crock pot is almost like a permanent fixture on the counter. I have a broth cooking in it most of the time. To make life easy, freeze containers of stock in small portions ready for use in recipes. It is great to have a lot of stock on hand in the freezer for making soups, beans, rice, sauces, gravies and lots more. Place the meat, bones and parts into a large crock pot or stock pot. Add 1 to 2 tablespoons of apple cider vinegar to the pot. Fill the pot the rest of the way with filtered or pure water. Optional: add any vegetables, fresh or dried herbs, cloves of garlic (you can get creative here!) to flavor the stock. If using a crock pot, turn to low and let cook for 24 hours. If using a stock pot, bring water to boil and then reduce heat and allow simmering for a minimum of 8 to 24 hours. The longer you let it cook, the more health benefits you will receive in your stock. That's it! This will last a few days in the fridge and 6 to 12 months in the freezer. What's your broth/stock routine? Have you noticed any differences in your health when you make and eat it regularly? Do you have any tips to share? This post featured in 39 Nourishing Postpartum Freezer Meals To Prepare While You’re Pregnant. Roxanne is mom to an almost 2 year old daughter and wife to a Massage Therapist. Trained as a Health Coach, Roxanne lives a holistic lifestyle and makes natural choices for her family. She loves cooking, cloth diapers, creating new recipes, making traditional foods, herbal home remedies, breastfeeding and natural beauty. Visit Roxanne at her blog: The Holistic Mama. I am a firm believer in the healing power of broth. I have been sharing my recipe with friends because I know how well it works. Is your recipe different than the one posted? Can you share it on here? My 15 year old daughter was just diagnosed with Hashimoto Thyroiditis disease. My daughter and other 2 daughters I have all have congenital heart problems, compounded with a metabolic disorder – Mitochondrial disease. I am trying to get back to eating the way God had intended, before all the boxes of quick dinners became the staple in many homes, as well as my own. I know the first step is healing her gut with bone broth from grass fed animals (such a hard find here in Northeast) but I have found some farms who raise their animals on grass only. Please share your recipes. Fish stock seems so foreign to me and what would I use it for? Doesn’t sound appealing enough to drink. That’s great Mona, I think it’s so important to share healthy ideas and recipes with friends so we can spread health and healing to everyone around us! I received a couple tips when I learned how to make stock this Thanksgiving. First, start with cold water. Something about using cold water extracts more gelatin from the bones (or at least that’s what I was told). The second tip was, instead of skimming off the oily layer that floats to the top, refrigerate the whole thing, the fat layer hardens on the top and can easily be scraped off with a spoon and saved in a jar in your fridge. This is called schmaltz in Jewish and German cultures and is used in the same ways one would use butter or bacon grease. I fry eggs in it and it tastes amazing!! Our Thanksgiving turkey gave one quart of schmaltz and something like 10 quarts of stock. We made turkey stock in the crock pot for the first time last week. I have made only chicken broth and only on the stovetop in the past. I noticed the turkey broth was much less gelatinous. Is turkey broth overall less gelatinous or is it the crock pot method that yields less gelatin? Thanks! I find that broths rarely come out exactly the same. I don’t see a huge difference from using the crock pot versus a regular stock pot but there are a lot of factors that can change the broth. It will be different if the meat, bones, etc are cooked or raw, also the parts of the bird/animal you are using, and the cooking time. Turkey and chicken come out similar for me, although I prefer the taste of the chicken broth over turkey. Thanks, Roxanne. I prefer the chicken stock as well… was just wondering why the turkey broth would have come out with so much less gelatin. We throw in everything we have, skin, bones, innards…. Mr. Turkey just came out thinner and a bit “birdier”. Oh well, we don’t eat much turkey around here anyhow! Could you please recommend a crockpot. I’m new to this but would like to get started. Hamilton Beach sells a good crock pot from my research, I have 2 of them. You can use either, and you can also pre-roast bones to bring out more flavor. They are all beneficial. The only bones that would not be as beneficial are those that are already boiled because they’ve already released nutrition into whatever they already made. However, they may still have nutrition left so still good to use. Fell in love with bone broth when we did the GAPS intro. Now I find homemade broth improves the flavor of any dish. Elizabeth Briggs – could you recommend a good cookbook or book to help me understand GAPS diet. My daughter was diagnosed with Hashimoto Thyroiditis and I seem to be at a loss for what he can and can’t eat. It is a totally new concept and I feel very overwhelmed trying to find out as much as I can. Just drank my turkey stock for lunch. I was fortunate to get an 18qt Nesco for Christmas and opened it early so I could use my turkey bones!!! How wonderful to just scoop it up for meals. I have a feeling 18qts is going to last me a long time, it’s going on 3 days of cooking low. So much more efficient than my 8qt stock pot that I have to watch on the stove! Is a little roaster chicken (bones) enough to make stock or do I need more? I called dibs on the turkey bones and giblets, neck, for making stock. Nobody eats the drumsticks, should I throw them in with the meat on ? You could use the small roaster chicken, just don’t use too much water. If you have a lot of water with a small amount of chicken the broth won’t come out as thick. Yes, I would throw the drumsticks in with the meat on! Meat and skin add flavor and health benefits as well as the bones. I watched Sarah Pope’s video on making stock, which can be found on the Weston A. Price Foundation web-site when you click on videos. She has done several videos for WAPF explaining traditional methods of cooking. She said to get more gelatin in the stock add just enough water to cover the bones. Too much water seems to be the problem with not getting the stock to gel. I like to add as much water as possible to get as much stock as possible, but my stock is usually thin and not very gelatinous. I am going to try her suggestion and see how it works, and just make stock more often. I hope this suggestion helps others. I bought a bag of chicken feet from Whole Foods last week. I think it cost around $5.00. That should help gel the stock, too. Maybe your Whole Foods carries chicken feet, too. Happy stock making! Excellent point! Less water makes a much thicker stock. I love this idea!! I just hate to throw away anything and since I make my dog’s food this is a great way to get added health benefits for the dogs too! Thanks! It was a total experiment the first time I did it and I prayed the entire time until they pooped. But I even chewed on it myself and it was fine to digest. I thought about blogging about this, but I am fearful that someone might not really know how important it is to cook it for a LONG time. I’d love to see your dog food recipe! I am trying to get away from bagged food (even the ‘healthy’ expensive kind) as there are too many denatured ingredients and grains that are not natural to their ancestral diet. Yeah I bet, I would be nervous too. I don’t have an exact dog food recipe I usually do chicken or beef or the “pet food” blend from my Amish farm which is a mixture of organ meat and then I mix it with some vegetables, kelp powder, ground flax, sometimes oats. I’ve heard of people using nutritional yeast in dog food also but havn’t tried it myself. Maybe I’ll do a post about dog food! The gelatin in bone broth also soothes the intestinal lining so someone will stomach problems will find it useful to eat. Are the terms broth and stock interchangeable? The terms broth and stock tend to be used interchangeably becuase there is only a slight difference. My understanding is that a stock what you get straight out of the pot after cooking for a length of time and broth is a seasoned stock that you would use in a soup. I too find that my poultry stocks do not gel. I will ask Whole Foods about chicken feet. I am 35 with osteopenia/porosis. I know bone broths are good for me. How do I know how much calcium I am really taking in with my broths. I don’t drink endless amounts because it would be too expensive to maintain that level of supply. My boys and I do drink about 3/4-1 1/2 cups a day. I don’t know a way of knowing exactly how much you are getting. I would guess its not the same from batch to batch either becuase every animal is different. The only thing you can do is go by how it makes you feel, I am a full believer in listening to your body. I don’t know if anyone else knows of a way to know find that out? Have you considered using milk kefir? It would be an excellent source of calcium for your condition. To increase calcium levels in your broth, add eggshells to the water and bones and then add your vinegar. I always let mine sit for a couple of hours in the vinegar and water before I turn the heat on. Just strain the eggshells out when you strain out the vegetables. Voila, extra calcium. You can also add azomite powder to your broth to help you absorb the calcium. It doesn’t change the flavor, and provides crucial trace minerals that your body needs to heal your bones. Hope that helps. Is it true that you can use the bones twice to make two pots of stock with one set of bones? I’ve never tried that myself but sounds like its worth a try! I made a second batch of broth with the same bones last time I made bone broth with an organic chicken carcass and about 5-6 chicken feet. After 24+ hours of stovetop simmering, the larger bones weren’t yet disintegrated so I added just enough water to cover everything and simmered another 24 hrs. It made a thinner broth, but I suspect it was nutritious and fine for recipes that called for chicken broth. The gelatin in bone broth also soothes the intestinal lining so someone will stomach problems will find it useful to eat. I like to add as much water as possible to get as much stock as possible, but my stock is usually thin and not very gelatinous. Turkey just came out thinner and a bit “birdier”. The second tip was, instead of skimming off the oily layer that floats to the top, refrigerate the whole thing, the fat layer hardens on the top and can easily be scraped off with a spoon and saved in a jar in your fridge. Fantastic post! I’ve been making stocks in a crock pot for maybe a year now, and I love it! I usually do beef, but this year’s turkey came out delicious, and I have a package of chicken necks and backs that are crying out to be used. The last couple of pots I threw in some kelp powder that I’ve been trying to find a use for, it really adds to the nutrition, and makes the flavor richer, not fishy at all like I was worried about. 2-3 days on low is my magic recipe, then when it’s done a little sea salt and neither my boyfriend nor I can stop drinking it. I read through the comments on the dog food, I was wondering if anyone makes their own cat food. I have four furry babies and have been wanting to start making their own food for a while. I do usually the grain free dry food, and a few times a week give them a can of moist, but I’d rather feed them close to their ideal diet. Any suggestions? I can broth all the time , but am I losing some of the benificial aspects of the broth through the canning process? Just shared a link to this on my side. So thankful for post like this! Keep up the good work. I always keep a bag of bones in the freezer. Same with vegetable peelings. My question is: how about eggshells? Has anyone used them routinely in their broths? Making chicken stock as I type! Started it last night and continuing to let it cook today. I also use a lot of onion and garlic as they are so healthy!! I run onions, garlic, celery , spinach, or kale, mushrooms and carrots through my food chopper for the broth. Then when I actually make the soup from it with meat, vegetable and a healthy grain like guinoa, it is packed with nutirents!! I tell my family they must eat the soup to ward off cold and flu!! It seems to work! I have never heard of putting apple cider vinegar in it before. I am putting it in though now! What is the purpose? I have begun using my instant pot for stock and am amazed at the results.Now after refrigeration I can literally turn the jars upside dis and not loses single drop! I used rabbit, duck, goat, beef, chicken. Lamb, goose, moose and venison bones. All of my broths gel now thanks to the instant pot. To save energy, I pressure can the stock in pint jars and hold them on my store room stairs I no longer worry about plastic or breakage. There is not the noticeable smell of stock cooking and I save on electricity. Has anyone made stock from Silkie chickens? Butchering tomorrow and am curious what colour the bones are going to make the stock or how the fat will render. I have a question that keeps nagging. If you’ve already cooked your chicken or roast all night on low, do you not get some gelatin that way, and is there still gelatin left in the bones to still be cooked out? I was curious if you used meaty bones, if you could take any of the bits of meat to add to your broth,…or are you supposed to completely strain the broth before consuming? Do you usually just use a standard stainer to strain things out when you’re done? Or what do you do when it’s done cooking? Broth novice here… Thx!